Western Australia's largest inland town, serving as a hub for the Avon Valley farmlands. The Avon River flows through town and is a beautiful river where you can see plenty of native Australian birdlife and Australian gum trees. The tranquility of the countryside around Northam will leave you feeling rested and peaceful. Northam is 98 kilometres north-east of Perth. Northam is an inland town situated in the wheatbelt area of the Experience Perth tourist region. Northam is surrounded by the undulating countryside of the Avon Valley and the Avon River meanders through the town. Northam is one of the largest towns in the local area. One of the best ways to get to Northam is to hire a car from Perth Airport. This beautiful river meanders its way through Northam and is fringed by grassy banks and shady trees, providing numerous spots for picnics. Home to Australian birdlife and also European White Swans. 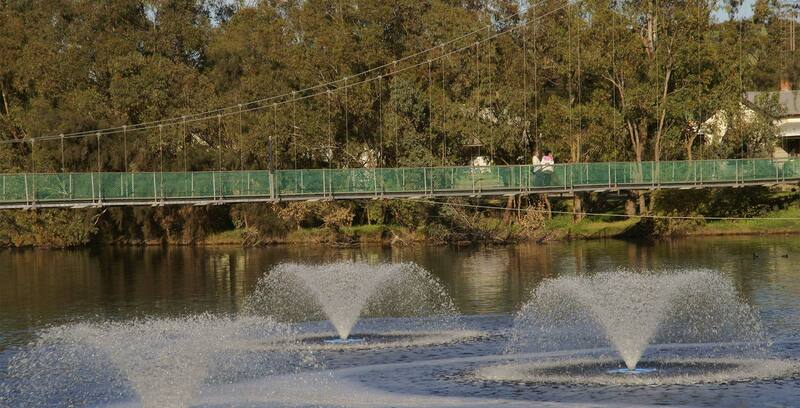 The pedestrian bridge which spans the river is the longest of its kind in Australia. Built in 1836 by John Morrell, the founder of Northam. The cottage was Northam's first church and school but has now been lovingly restored and converted into a museum which showcases the colourful history of the town and surrounding areas. Another piece of yesteryear well worth a visit. The magnificent building of the Old Railway Station used to be the hub of activity and the main entry point into Northam during the 19th and 20th centuries. Listed with the Australian National Trust, the building has been restored and converted into an interesting museum. Experiencing a moderate-mediterranean climate, the hills around Northam mean the town experiences misty rainfall most of the winter. Green pastures surround the town as the temperatures and rainfall support a high level of wheat and dairy farming. Long periods of sunshine all year. In Summer (December to February), the average maximum temperature is 38°C with an average minimum temperature of 22°C. In Winter (June to August), the average maximum temperature is 18°C with an average minimum temperature of 10°C. Founded in 1833 by Ensign Robert Dale, the town was named by Governor Stirling, after a village of the same name in Devon, England. Almost immediately it became a point of departure for explorers and settlers who were interested in the lands which lay to the east. This initial importance declined with the growing importance of the nearby towns of York and Beverley but the arrival of the railway made Northam a major departure point for fossickers and miners who headed east towards the goldfields. A notable scandal occurred in 1933 when the town's entire Aboriginal population were rounded up by police and dumped in the Moore River Settlement. The Northam Shire Council said they had scabies and were a health risk.